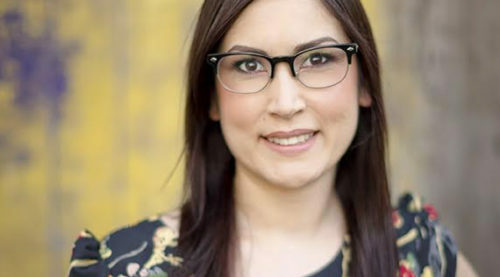 Artist Joi Arcand will create a text-based public art piece that will use Cree syllabics to respond to the location of Moose Jaw and its historical significance to Indigenous peoples. Moscastani-sipiy, the Cree name for Moose Jaw, means “a warm place by the river”, referencing its significance as a traditional winter camp for Cree and Assiniboine nations, where tribes would come together to take in the warm mineral waters. 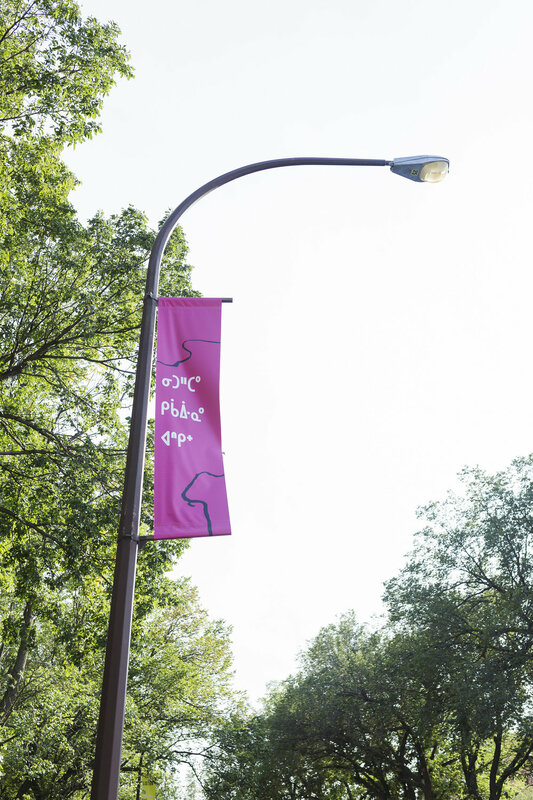 The public art piece will consist of a series of banners that circle the edge of Moose Jaw’s Crescent Park, located in its downtown and across from the present-day, mineral spa, as well as a series of banners displayed on the exterior of the Moose Jaw Museum & Art Gallery, also located in Crescent Park. Arcand explores the interruption of intergenerational language-learning, as a result of the residential school system and other colonial attempts to remove Indigenous culture, through the revitalization of the Cree language. 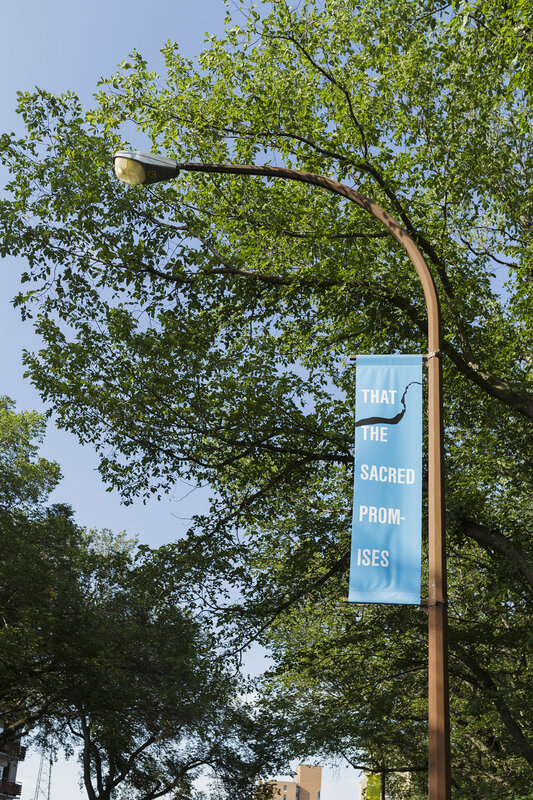 Emphasizing the discontinuation of the language within Arcand’s own family by rendering it hyper-visible in location and material, the work further questions how the public presence of language is connected to acknowledging Indigenous peoples. Listen to the land (Mother Earth), she will tell you that the sacred promises will never cease. 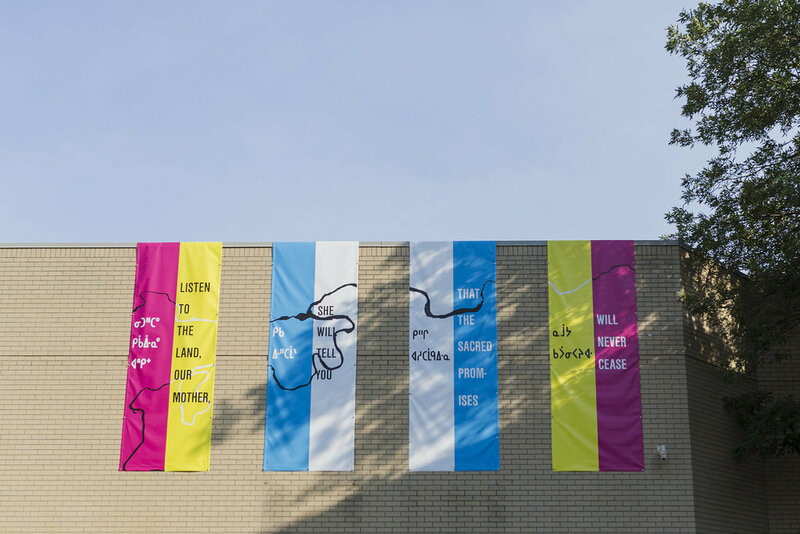 Joi T. Arcand’s text-based public artwork, “Listen to the land…” consists of a series of banners that circle the edge of Moose Jaw’s Crescent Park, located in its downtown and across from the present-day mineral spa, as well as a series of banners displayed on the exterior of the Moose Jaw Museum & Art Gallery, also located in Crescent Park. The work is a testament to the Spirit and Intent of the numbered Treaties; specifically, Treaty 4, where Moose Jaw is located; and Treaty 6, where the artist was born and raised. The text, provided by Darryl Chamakese of Chitek Lake, Saskatchewan, describes the everlasting nature of the Treaties. Arcand pairs Plains Cree syllabics with the shape of the Moose Jaw river; specifically, wakamow (The Turn), referencing its significance as a traditional winter camp for millennia, by the Cree and Assiniboine and other groups. The text reminds us that the waters and the land are inseparable from ourselves, and pays respect to the sacred promises of Treaty.